Colossians 1:11-14 – May you be strengthened with all power, according to his glorious might, for all endurance and patience with joy, 12 giving thanks to the Father, who has qualified you to share in the inheritance of the saints in light. 13 He has delivered us from the domain of darkness and transferred us to the kingdom of his beloved Son, 14 in whom we have redemption, the forgiveness of sins. A lone tree silhouetted against the darkness of a stormy sky along Skyline Drive near Big Meadows. Shenandoah National Park, Virginia. 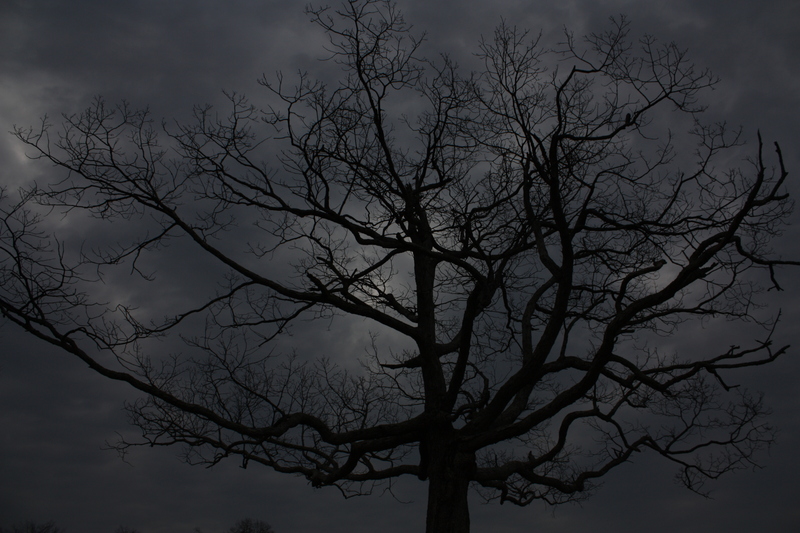 This leafless tree silhouetted against the gloomy skies screams “darkness” to me. Yesterday’s photo from Yosemite was post processed to create a black and white image from a color image, but today’s photo is actually an untouched color image. That is just how dark and gloomy it was on this particular early spring day in Shenandoah National Park. We are in the midst of a joyous season as we anticipate the coming of Christmas. For many it is a time filled with excitement as preparations are made to celebrate with family and friends. We rush about from store to store buying gifts and stocking our pantries with food for our holiday meals. But, despite all the festivities, it is often a time of great darkness for those around us who struggle with loneliness or depression. Even as Christians we deal with times of darkness in our lives, times that we are under attack from the Prince of Darkness himself, or times that we are simply battling with the day-to-day realities of life in a fallen and sinful world. If you are suffering right now, or know someone who is, take the time to bring those troubles to God in prayer and seek answers through his word. Today’s passage from Paul’s letter to the Colossians offers great words of prayer and encouragement, and also reminds us that God has already “delivered us from the domain of darkness” through our Lord and Savior Jesus Christ, who is our only true hope and joy. This entry was posted in God is Revealed... and tagged Big Meadows, Christmas, Colossians 1, Darkness, Depression, God, Jesus, Shenandoah National Park, Skyline Drive, Virginia by Todd D. Nystrom. Bookmark the permalink.